Just before Christmas 2013, Maru flew in from Miami to join the team of Kit’s Couture models. 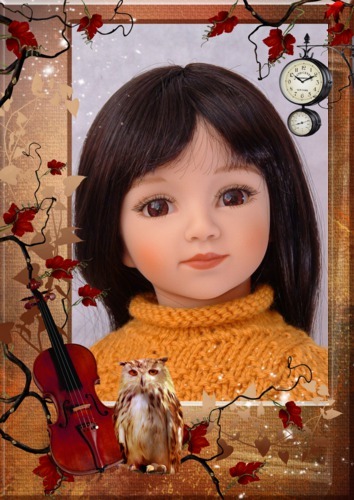 Maru (of Maru and Friends) is another ethnic doll, a Latina girl. She was designed by Diana Effner who specialises in porcelain dolls. It may be a coincidence, but her vinyl does look and feel like porcelain, and as you might expect the styling and artwork of her face are exquisite. I would not say she looks particularly Latina, but she is a very beautiful girl indeed with her dark eyes, luxuriant eyelashes, porcelain skin and long dark brown hair. Maru is tall at 20″ and most of her extra height is in her legs which seem to go on for ever. She is a slim-bodied doll, a little larger in the torso that the Kidz, but she can share some clothes with the Kidz ‘n’ Cats girls and with Gotz Hannah. The main difficulty is that her arms and legs are longer than theirs which means that long trousers become cropped in style, and the Kidz’ long sleeves become 3/4 length. Maru has only five joints, but they are ball-joints which make her able to take quite a variety of poses. Her head joint is particularly successful and she can look down and up far more effectively than, say, the Kidz whose heads have a tendency to spring back to a level position. Maru’s arms are modelled with a relaxed-looking bend at the elbow. Her legs are the least successful, dead straight and with very tiny feet for her size. She can’t share shoes with the Kidz: her shoe size is smaller than theirs at 65/27 mm. Such tiny feet on long slim straight legs means that she is rather top-heavy and can be difficult to balance. Her hair is a dark-brown Kanekalon wig reaching to below the hip. It is not dead straight – there’s a slight wave in it and a curl at the end – and her fringe is also slightly wavy. The texture is soft and quite silky, easy to brush and look after. Maru is supplied in an outfit of short pleated caramel-coloured needlecord skirt, winter-white sweater and hat, winter-white tights and suede-type boots in winter-white with deep cuffs in caramel needlecord. These colours do suit her, although the stronger autumn colours like moss green and corn gold definitely do more to enhance her colouring. All in all she is a beautiful doll, and I’m looking forward to sewing and knitting for her.